Madhubala winks from the banner to my Bollywood posts. Pyar Kiya To Darna Kya ranks in my top ten Bollywood dance numbers. I’ve spent many a Saturday shut in my office with Naushad’s soundtrack soaring through the background. But, until this weekend I had never actually watched Mughal-e-Azam. Shameful. Mughal-e-Azam is the biggest Indian film of alllll tiiiiime. It’s so big, the Indian army appear in the credits. It’s so big, it took K. Asif 15 years to make. It’s so big, it has Prithviraj Kapoor on a war elephant. It’s so big, it’s not even banned in Pakistan. For something so epic, the plot is simple: Dilip Kumar falls in love with Madhubala. At least, it would be simple if he wasn’t Prince Salim and she wasn’t common Anarkali … and his Dad didn’t happen to be Mughal emperor and dead set against it. It’s not just an epic: it’s a historical epic. 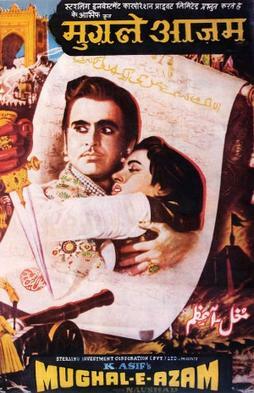 Emperor Akbar is played with broad-chested, brooding, ‘tached gravitas by Prithviraj Kapoor. He glowers. He intones. He strides. He has a penchant for pastels. Dilip Kumar, meanwhile, has amazing hair. It only drifts out of place when he’s atop a tower and about to be blow up by a cannon – and a flyaway quiff can be excused, given the situation. As romantic prince he seems painted, smoothed into his clothes. Madhubala, first appearing as a living statue, is every ounce the cinematic icon. She is beautiful; in Teri Mehfil Mein Qismat she even sparkles. We first meet her in Mohe Panghat Pe, Anarkali’s debut dance for the royal court. These are the moments of Salim’s falling in love with her, and surely us too, because she winks and simpers and bites her lip. The camera delights in her, from the first plan from the backing dancers’ multicoloured ghagras to her perfect veiled pose, centred – just there – at the bottom of the screen. Madhubala’s wondrousness wavers beyond the songs, however. She is at her best in the eyebrow raises and the chin tilts; in dialogue she gives quivering starlet, and not much happens beyond the swoon. The exception is the fantastic moment post-Pyar Kiya To Darna Kya, where she meets Prithviraj Kapoor’s chest-beating with fierce certainty. I cheered. Nigar Sultana plays courtly rival Bahar, with a perfect husk to her voice and glint to her eye. Near the end when things are rapidly falling apart she appears dressed in black, like a carrion bird come to feed. I think what enchants me most about Mughal-e-Azam is the colourisation. There’s something extraordinary about colouring a film in forty years after its initial release. And, perhaps there is something loving about bringing Anarkali, Salim and Akbar to life again. It’s a little garish, a little oversaturated, and yet most of all it’s magical.